Looks beautiful, right? She will literally eat you. The announcement was made via Facebook yesterday. Is anyone as freaking excited as me?!?!?! We'll see how they pull of t he craziness that is Renesmee in film. I don't want to spoil, but some real wacky S goes down with this little angel baby. Excited! Gorgeous girl. I have to admit, I hate that friggin name though - Renesmee. Sounds like a sneeze. Wow she is definitely beautiful. A little too old to play the part, but she's definitely very pretty! 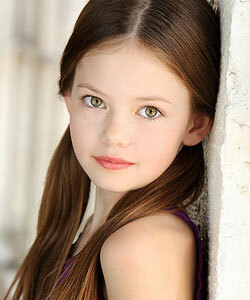 She's definitely a gorgeous little girl but too bad Breaking Dawn was one of the worst novels in the history of time. It ruined the entire Twilight series for me. I can only imagine how bad the movie will be.